This mystery wrapped in a ghost story has all the right elements: overcoming adversity, false love, true love, tragedy, lost treasure. 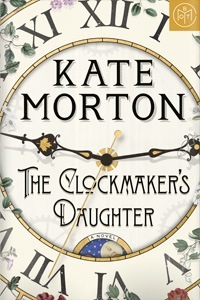 While there are quite a number of important characters and the story hops through times from 1862 to the present, Morton pulls it all together. Morton’s charming language and fresh choices in verbs and adjectives make her novels a delight to read. However, the many characters and time settings of this particular novel almost had me pulling out the red yarn and pinning connections. I rather wished she’d eased up on the complexity of her story; with fewer characters I could get to know the remaining ones much better, and I did want to know them. They deserved the attention. The point in common for every one and every time within this novel is a charming house on the upper Thames River called Birchwood Manor. An artists retreat, a school for young girls, refuge for a young family during World War II, inspiration for a haunted man, and site of a continuing mystery–it plays many roles but feels like “home” to all it serves. The chance discovery of an artist’s satchel is the impetus driving all that follows, with many flashbacks to events that took place far in the past as well as things still happening at Birchwood Manor. The items in that satchel, as well as the bag itself, connect to different stories in Birchwood Manor’s history. Morton is a skillful storyteller. In lessor hands this could be a real mess. However, I think it would have been much better if she’d narrowed her focus. Professional archivist Elodie is handed a satchel that has been lost for more than 150 years. One of its contents is an artist’s sketchbook with a drawing of a house that looks exactly like the one her mother described in her fairy tales. The coincidence, and Elodie’s strong sense of familiarity with the place, sends her on a search. As we go with her, Morton reveals the house’s past through its inhabitants, including its ghost. This entry was posted on Friday, April 5th, 2019 at 3:04 pm	and is filed under Book Reviews. You can follow any responses to this entry through the RSS 2.0 feed. You can leave a response, or trackback from your own site.